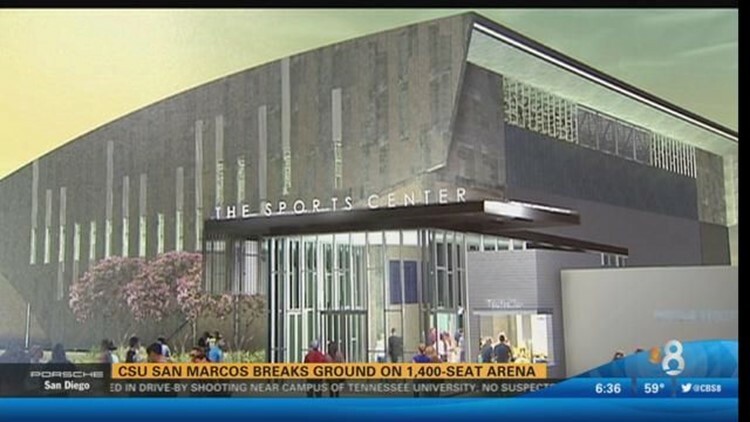 Cal State San Marcos broke ground Monday on a 1,400-seat arena for its intercollegiate basketball and volleyball teams. SAN MARCOS (CNS) - Cal State San Marcos broke ground Monday on a 1,400-seat arena for its intercollegiate basketball and volleyball teams. The Cougars been forced to play "home" games at other North County sites the past several years because of a lack of an on-campus sports center. "This facility is a game-changer -- for our campus, our athletes and our region," said Jen Milo, the school's athletic director. Cal State San Marcos President Karen Haynes called the athletes "the heart and soul of Cougar pride." CSUSM is in the process of moving from the NAIA to NCAA Division II, the same level as UC San Diego and Point Loma Nazarene. The basketball teams have played at MiraCosta College and the women's volleyball team at Escondido High School the last few years. Despite the lack of a real home, the men's basketball team has been highly ranked in the past couple of years, and completed its 2014-15 season Saturday with a 30-4 record, following an 80-76 overtime loss to Dalton State of Georgia in Kansas City. The arena is due to be completed in the fall of 2016.